It can be stressful if your outside space is so untidy that you are completely unable to relax in your own garden. If you are in the Hackney area and you have had enough of tripping over rubbish, call Rubbish Removal Hackney and we will come and take it all away for you. We have a reputation for getting on with the job at hand with maximum efficiency. Our experienced teams are available in the E5 and E9 postcodes for whatever your garden junk collection requirements are, large or small. Simply call us today on 020 8396 7403 and we will be happy to provide you with a free quote for your garden waste disposal needs. If you want to work on your garden, perhaps laying some decking for the summer or creating a patio, we make the job easier for you. Our garden clearance services Hackney E5 will take away the stress of mess, leaving you with the space and time to plan your garden’s transformation. 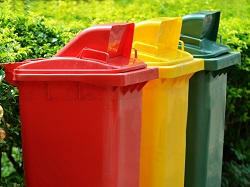 At the same time, we are eco-friendly and your organic and non-organic waste will be disposed of responsibly. Often, clutter accumulates in garden sheds as they tend to become a dumping ground for things. Our professional garden sheds clearance services will restore your shed to a manageable space you can arrange in a more orderly fashion. Imagine never having to dig through piles of garbage to get to your gardening tools! Whether it’s a garden, patio, shed or land, we are your first point of contact for Hackney garden waste disposal. Call 020 8396 7403 today and reclaim your leisure space again. Imagine sitting in your own back garden and not seeing rubbish strewn all over the place! General garden maintenance Hackney E5 such as pruning or mowing lawns is not included in our garden waste clearance services although we will certainly make the job easier for you. Our teams come equipped with all the necessary tools to do the job efficiently, while you can sit back and relax. Residents in the E5 and E8 postcode districts can be assured of an efficient service together with our professional attention at all times. Cost is an issue for most people these days and that’s why our garden clearance prices are affordable and competitive. Our experienced teams know how to separate hazardous waste and green waste from the rest and will always ensure responsible disposal. You will not find a more experienced garden waste clearance company in Hackney E5! If you have a patio but can’t actually see it for rubbish and waste all over the place, you will be delighted when our Hackney patio clearance restores it to an area where you can sit and enjoy outside relaxation. You’ll be amazed at the difference it makes to a garden to have all the waste and rubbish removed in one hit. Our services have earned us a great reputation in the Hackney area and it is one we fiercely protect. London is an expensive place to live and green spaces are few and far between. That’s why you’ll particularly enjoy the benefits of Rubbish Removal Hackney’s garden waste disposal services E5; there’s no more need to go to the park to see the grass! Our customers in the E8 district are always saying how much they appreciate the transformation in their back yards because of our services. How can you plan changes to your garden when you can’t see clearly what space you’re dealing with. The first step in any major change outside your house is to remove all the unnecessary rubbish and waste that’s accumulated over time. If you want to completely transform your outside space, call 020 8396 7403 today and speak to the Hackney garden waste removal specialists.